Quick overview Throughout the late medieval period, from 1300 to 1500, England and France were bitter enemies, often at war or on the brink of it. 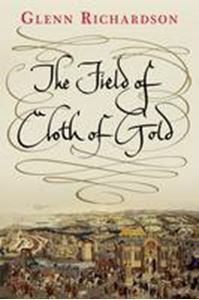 In 1520, in an effort to bring conflict to an end, England's monarch, Henry VIII, and Francis I of France agreed to meet at "the Field of Cloth of Gold". The author offers a fresh appraisal of this historical event. Glenn Richardson provides the first history in more than four decades of a major Tudor event: an extraordinary international gathering of Renaissance rulers unparalleled in its opulence, pageantry, controversy, and mystery. Throughout most of the late medieval period, from 1300 to 1500, England and France were bitter enemies, often at war or on the brink of it. In 1520, in an effort to bring conflict to an end, England's monarch, Henry VIII, and Francis I of France agreed to meet, surrounded by virtually their entire political nations, at "the Field of Cloth of Gold." In the midst of a spectacular festival of competition and entertainment, the rival leaders hoped to secure a permanent settlement between them, as part of a European-wide "Universal Peace." Richardson offers a bold new appraisal of this remarkable historical event, describing the preparations and execution of the magnificent gathering, exploring its ramifications, and arguing that it was far more than the extravagant elitist theater and cynical charade it historically has been considered to be.